The deadline for the submission of abstracts to the 34th IAS Congress of Rome 2019 is approaching (30 March 2019). The 34th IAS meeting will be held in Rome from 10-13th September 2019 (http://iasroma2019.org/). 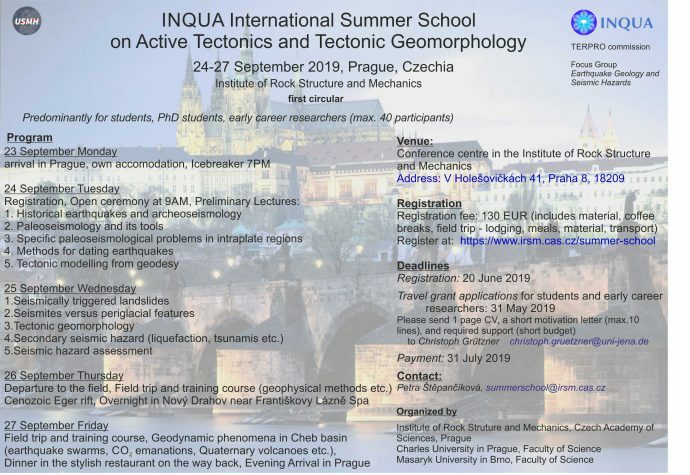 There will be lots of interesting sessions, of special interest for the earthquake geology community will be session 7.11 The Sedimentary Record of Earthquakes, Tsunamis and other Extreme/Catastrophic Events. The INQUA Congress in Dublin will be the event for Quaternary science this year, but Dublin is quite expensive and many ECRs will need travel support. While the application deadline for the INQUA grants has already passed, there is still an option for early career scientists from the US to get up to US$ 2,000. See the INQUA Dublin website for details and make sure to not miss the deadline March 15, 2019. There is a wonderful, amazing, extraordinary postdoc position open at Oxford University: Palaeoseismology of Central Asian Earthquake Ruptures. We seek to appoint a postdoctoral research assistant to undertake investigations of large earthquakes within the interior of Asia. The post is part of a project funded by the Leverhulme Trust called EROICA. The successful candidate will work closely with Professor Richard Walker, and will join a vibrant community of active tectonics researchers in Oxford within the Earthquake Geology and Geodesy group. The researcher will be responsible for the detailed mapping of palaeo-earthquake ruptures, the construction of slip distributions from individual earthquakes, the analysis of high-resolution satellite imagery, the construction of digital topographic models, and the selection of sites for long-term slip-rate determination using field investigation. The PDRA will also be involved in planning and carrying out fieldwork to verify remote-sensing observations, to collect samples for dating, and to excavate and interpret palaeo-seismic trenches. We expect the researcher to help in supervising doctoral and masters student research projects, in addition to undertaking their own research. The 7th International Colloquium on Historical Earthquakes & Paleoseismology Studies will be held from 4-6 November, 2019, in Barcelona (Spain). The conference website is now online (https://cloud.agoraevent.fr/Site/134404/5997/Event). From 24 to 26 October 2018 55 scientists from 14 countries gathered at Han-sur-Lesse in Belgium for the annual gathering of the Colloquium on Historical earthquakes and Seismology. During this well attended conference, four invited keynote talks, 27 oral and 16 poster contributions were presented. Topics in this multidisciplinary colloquium spanned four themes. The first three themes are recurrent themes in this Colloquium series and focused on (1) Seismology and Historical earthquakes, (2) Paleoseismology and (3) Archaeoseismology. The organisers also specifically wanted to focus on (4) Earthquakes and natural caves; a discipline in which major progress was recently made. This topic was heavily debated during the field trip to the Han-sur-Lesse and Rochefort caves on 25 October 2018. Hereinafter we summarise what was presented (see program) by the attendants and which challenges seismologists – and friends – face these days.